Kansas City — A season after a thrilling and improbable October run left the Royals 90 feet from tying Game 7 of the World Series in the bottom of the ninth inning—the result of third base coach Mike Jirschele throwing the brakes on Alex Gordon instead of risking a play at the plate—they’ll get another chance. Jirschele’s alert decision to send Lorenzo Cain home from first base on Eric Hosmer’s long single into the rightfield corner in the bottom of the eighth inning paid off, providing the difference maker in the Royals’ pennant-clinching 4–3 win over the Blue Jays in Game 6 of the ALCS. In Cain, who had drawn a leadoff walk off Roberto Osuna to start the eighth, he had one of the Royals’ fastest runners, a speedster who stole 28 bases in 34 attempts this year. Even on an infield dampened by the 45-minute rain delay between halves of the eighth inning, the 29-year-old centerfielder’s legs were a blur as he motored around the bases. 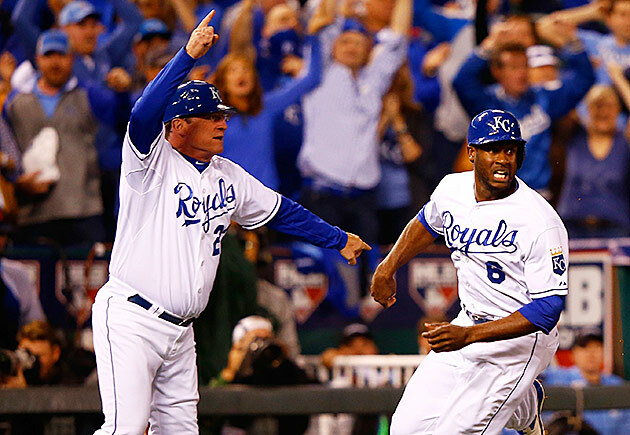 Manager Ned Yost and general manager Dayton Moore praised the third base coach. “He did his homework,” said Yost. “Jirsch has been waiting to send a runner in that situation all series,” said Moore. Cain’s mad dash provided the capper in a tight, thrilling game that began as a pitchers’ duel between Yordano Ventura and David Price. After three previous postseason starts in which he allowed nine runs in 12 1/3 innings to the Astros and Blue Jays, Kansas City’s mercurial 24-year-old righty rose to the occasion with his best start of the month, allowing just one run on four hits and two walks in 5 1/3 innings while striking out five. All of the K's came via his curveball. Ventura had that command. According to Brooks Baseball, of the 21 curves he threw, 15 went for strikes, including nine out of his first 10. Including his changeups and cut fastballs (which average 5–6 mph slower than his four-seamer and sinker), 26 of his 38 off-speed pitches went for strikes, as did 51 of his 77 total pitches. Talked to a scout recently who said his report to his team was to do whatever possible to raise temper of Ventura, to get him out of sorts. Whether or not he was actually rattled, Ventura did walk the first two batters of the fifth, Russell Martin and Kevin Pillar, on a total of 10 pitches. He recovered to get the next two batters to fly out, and then Mike Moustakas made a diving snag of a 114-mph rocket off the bat of Josh Donaldson as the Kauffman Stadium crowd of 40,494 went berserk. Ventura departed after yielding a one-out double to Edwin Encarnacion in the sixth inning, but not before retiring Bautista on a routine fly ball. As Kelvin Herrera came on, extricated him from that jam and worked a perfect seventh inning, Yost appeared poised to stick with the formula that found him so much success in the past two Octobers, marching one shutdown reliever after another out of the bullpen. On the other side of the coin, Price turned in his best start of the postseason—three runs allowed in 6 2/3 innings, with eight strikeouts over the course of 99 pitches—but he continued his streak of October disappointments, failing to notch a win for his eighth start across four separate trips to the playoffs with three different teams (he did collect a win in relief in 2008). His former Rays teammate, Ben Zobrist, connected for a solo homer in the first inning to give Kansas City a 1–0 lead, depositing a 91-mph cutter left in the middle of the plate 372 feet to leftfield. In the second inning, Moustakas punished a fat changeup 390 feet to right centerfield, and while a fan leaned over the railing to catch a ball that may not have actually made it out, the umpires upheld the home-run call upon review, much to the chagrin of Blue Jays manager John Gibbons and his team. Price allowed a few other hard-hit balls early on and looked to be on the ropes after putting two on with two out in the third inning, but he recovered to retire Hosmer on a groundout, the first of a string of five straight batters retired, and nine out of 10 as the Jays halved the lead via Bautista’s solo homer. However, once a bloop single by Moustakas to lead off the seventh turned into a runner in scoring position with two outs, the ace lefty gave way to Aaron Sanchez, who allowed an RBI single by Alex Rios, giving the Royals what appeared to be a most welcome insurance run. Six outs away from a second straight pennant, however, Yost dialed a wrong number, calling for Ryan Madson, who had previously allowed three homers in five postseason innings, though he had pitched two scoreless frames in this series. Madson quickly became the wrong reliever in the wrong place at the wrong time while closer Wade Davis—he of the 0.97 ERA across the past two seasons, with seven two-inning appearances during the regular seasons and playoffs—sat. Madson yielded an infield single to Revere, struck out Donaldson looking and then served up a two-run, game-tying homer to Bautista. Unlike in Game 5 of the division series, Bautista didn’t bat-flip this one. The slugger’s 386-foot shot to leftfield did enough to temporarily silence the frenzied fans at Kauffman Stadium that you could practically hear his gently dropped piece of lumber hit the dirt as he began his trot around the bases. Madson walked Encarnacion before Yost could call upon Davis, who retired the next two hitters on eight pitches before the skies opened and delayed the game. At that point, it appeared as though Yost might have burned his best reliever; using him before the anticipated delay wasn't part of his plan. “Our plan … was [to] hope to get Madson through the eighth right there because we knew the rain would probably come. We didn't want to bring Wade in that inning unless we absolutely had to,” said Yost. “But the plan was if anybody got in scoring position or two outs, runner on and Encarnacion, we were going to bring Wade in. “But Bautista ended up hitting a two-run homer, Encarnacion gets on, I got to bring Wade in the ball game right there just to hold it. I was hoping the rain delay, they told me it was going to be a 15-minute rain delay. The gambit worked, though the Blue Jays didn’t go down without a fight. Martin singled to lead off the top of the ninth, and pinch-runner Dalton Pompey stole second and third base. Pillar walked and stole second as well on pinch-hitter Dioner Navarro’s strikeout, meaning that a single could provide not only the tying, but the go-ahead run. With home plate umpire Jeff Nelson’s strike zone seemingly expanding by the minute, the contact-oriented Revere struck out, and Donaldson grounded to Moustakas to end the game. With that, the Royals clinched their second pennant in a row, equaling the number they claimed during the franchise’s first 45 seasons (they lost to the Phillies in 1980 and beat the Cardinals in 1985). Their matchup with the Mets, which begins Tuesday, Oct. 27, at 8 p.m. ET at Kauffman Satdium, will be the first pairing of expansion franchises in the history of the Fall Classic, 54 years after the first wave of additions to the original 16 franchises. If it's anywhere close to as tight a series as their clincher was, it should be a treat.